How about some Paper Smooches goodies to start off the weekend? Summer is in full swing here in the US, but I've got my eye on my favorite season with this first card. 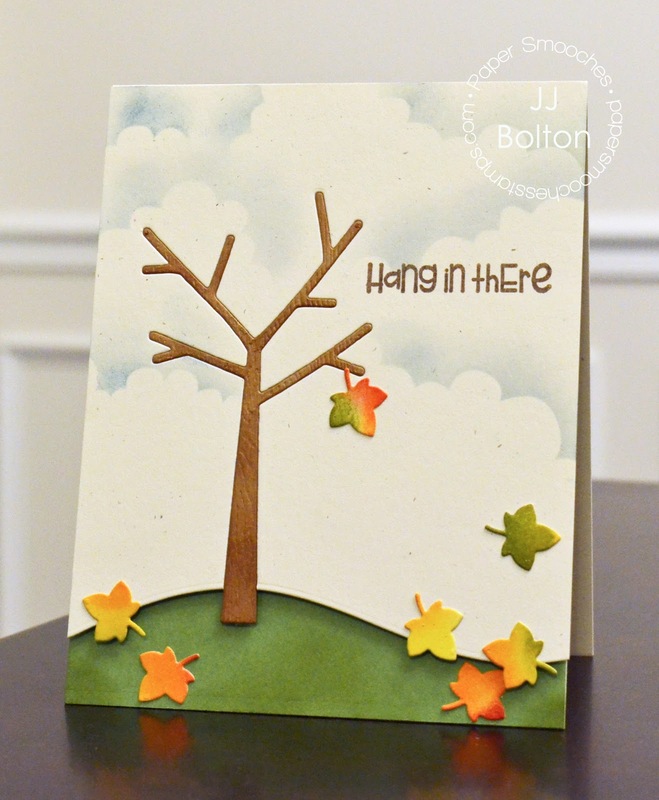 I love everything about fall and the new Paper Smooches Seasonal Trees dies works perfectly for a fall card! I die cut the tree from woodgrain paper and inlaid it into the sky panel. For a little subtle texture, I reverse die cut the hill (Borders 1 die) at the bottom of the panel. The green of the hill is blended ink on the card base. It's a fun change to recess the hill instead of pop it up:) The last step was to add a bunch of ink-blended leaves and a sentiment (from Hang Ups). My second card uses the School Icons dies to create an easy anytime card that good for a girl or a guy:) The "written" sentiment is one of the Hello dies which works perfectly with the pencil! Your first card is utterly gorgeous. LOVE IT. The blended leaves are amazing and your cloud background never fails to impress me. I love these! The scene on the first is perfect, and i LOVE how you used the pencil and word die on the second, so fun! I love your cards and thanks to Virginia, I've found a new person to inspire me. The tree is super cute and I love all the details you captured on the pencil! Such great cards...love the pencil writing the word. The 1st card shows why you're on a design team & I'm not - I would never have thought to recess the hill . It's so simple & so eye-catching. Two awesome cards, JJ! I love how blended your inks on the leaves and hill on your first card, and how perfectly the pencil works with the die cut sentiment on the 2nd one! As always, you're cards are fabulous!